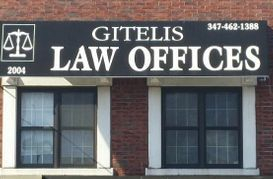 Gitelis Law Offices in New York City, NY. We are conveniently located in the heart of Brooklyn. Easily accessible by public transportation. Our comfortable office is easy to find. We are centrally located at 2004 Coney Island Avenue Brooklyn, New York 11223. Feel free to give us a call for directions. There is absolutely no charge unless we recover money for your losses. Our team will work tirelessly to make sure you are compensated for your injuries. If someone is at fault, we will make sure they are held accountable for their negligence. Our team has helped recover millions of dollars for our clients. Our founder, Steve Gitelis graduated from Brooklyn Law School in 1996 and has been dealing with personal injury cases for over twenty years. Rest assured that you are in the best hands. Our dedicated staff speaks English, Spanish, Russian, Hebrew, and Yiddish. We pride ourselves on personalized service and we'll do our best to make sure a successful outcome is achieved. Let us help you make this challenging time a little more peaceful. I felt so lost and confused trying to figure out the process. From the moment I called Gitelis Law Offices, they generously guided me step by step in helping me recover a significant amount of money for my injury. Me and my family are forever grateful! Maria Dominguez - Bronx; Auto Accident. If you have been injured in any sort of accident or mishap it is more than likely that you are entitled to monetary compensation. Gitelis Law Office has helped recover millions of dollars in compensation for our clients. There is no charge unless we WIN. That's right, you pay NOTHING unless we help you recover money. All consultations and meetings are 100% completely free. All you need to do is contact us as soon as possible so we can make your case our next big success!